Part sourdough starter, part pickling machine, nukazuke is a versatile Japanese technique for fermenting any and all sorts of vegetable. Traditionally, the Japanese mix rice bran, left over from polished white rice with water and salt, as well as sake, to form a stiff paste. A new vegetable is pressed into the paste each day until it tastes sufficiently sour, at which point the nuka is ready for full use. I became interested in nuka from Sandor Katz' The Art of Fermentation, and wanted to explore a version with oat bran and Geuze. Part Japanese, part Belgian. I started the nuka with one raddish, rubbed it with salt to abrade the skin, then buried it in the bran paste and left it for one day covered with a cloth. 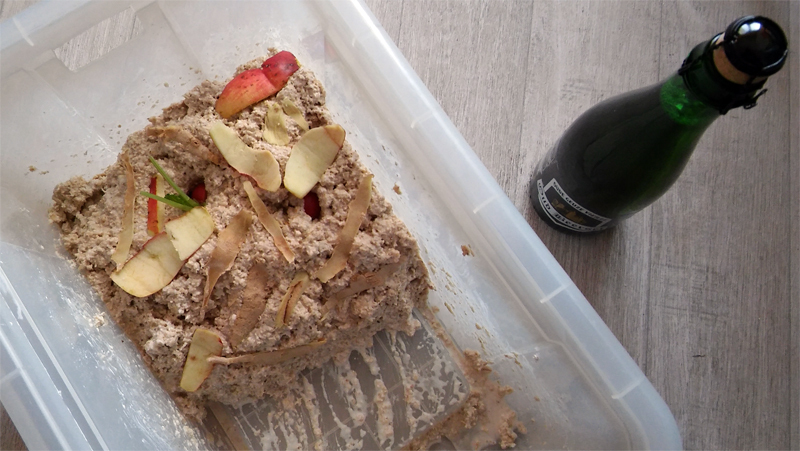 1kg oat bran, 375g Geuze, 200g water, and 50g salt + ginger and apple scraps.